Not all skateboarders are artists, but some are, and they are brilliant! 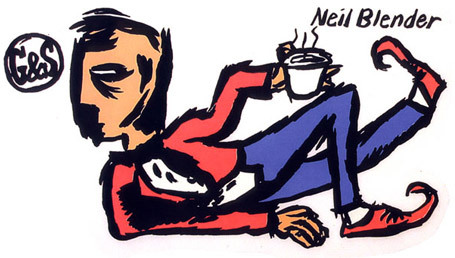 Neil Blender early art. by showing the skateboarding industry that you didn’t have to be located in California to have a sick skateboard company. Neil Blender has also designed collector's edition Nike Sb Dunk low, originally a basketball shoe which has long been popular with skateboarders. Skateboarders artists like Neil Blender, Mark Gonzales , and Lance Mountain helped skateboarding move from street activity to culture thanks to their creative care free style and mix of skating and art. Come Join Neil Blender with a Limited edition artwork that will be on show between Thursday, April 7 at 6:00pm and May 7 at 9:00pm at Location Thalia Surf/Vans close to the skateboard Mecca in the city of Laguna Beach, California.